Regular eye examinations are important because your eyes usually don’t hurt when something is wrong. The main sign for patients to report a problem is when the vision is a bit ‘blurry’. Therefore, it is vital to have a health check for your eyes so that we can pick up early signs of eye conditions before you‘re aware of any symptoms – many of which can be treated if found early enough. Here at Eye Design we aim to have the latest equipment to test your eyes, and to detect these changes at the earliest stage possible.Most people are apprehensive about the ‘puffer /eye pressure test’ but we now use the Tiolat iCare which is a ‘no puff test’ for measuring your eye pressures, which is more comfortable for you and barely noticeable. For a more detailed look at your eyes, our Optometrists would recommend all patients should have an Ocular Coherence Tomography (OCT) conducted, which involves taking a 3D scan of the back of the eyes. This is the latest and most advanced way to detect signs of early eye conditions such as Age-related macular degeneration, Diabetes, Glaucoma, Macular holes and other eye anomalies. The way in which this is achieved is similar to an ultrasound, OCT uses light rather than sound waves to illustrate the different layers that make up the back of your eyes. 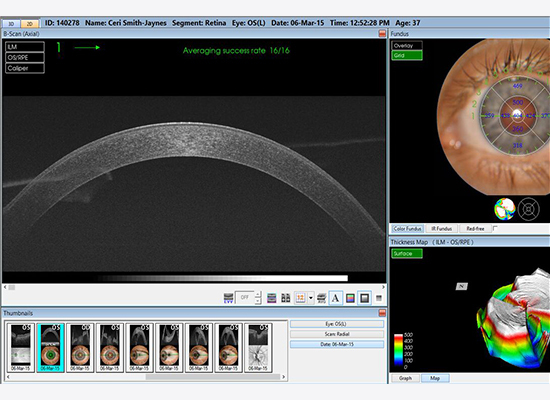 The OCT machine captures both a retinal photograph and a cross-sectional scan of the back of the eye at the same time. The scan is non-invasive, painless, simple and quick. What’s more the software can automatically detect even the most subtle changes to the retina with every scan. This gives an invaluable ongoing record of the health of your eyes. Our Optometrists will discuss the OCT images in detail with you. At Eye Design we are known for having the latest state of the art equipment. We can now proudly announce the acquisition of our latest OCT, the Triton from Topcon. 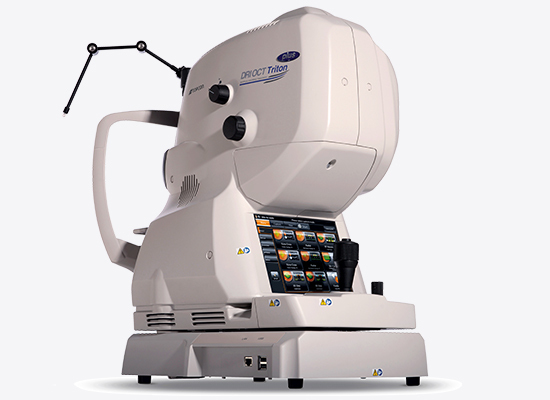 We believe the Triton has one of the highest resolutions available in the optical market, making it one of the best for early diagnosis and greater clinical efficiency. Furthermore, this scanning light also penetrates better through cataracts, haemorrhages, blood vessels and sclera ensuring for an even better diagnosis. Topcon believe the Triton probably has the world’s fastest scanning speed. The Triton gives us confidence in initial diagnosis, and ability to track change over time. We are proud to be the 4th Practice to have this incredible revolutionary equipment. So you can see that the Triton has the edge over some older types of OCT machines. We wouldn’t want you to compromise on your eye health and recommend that anyone who has a family history of Glaucoma, Macular Disease, is diabetic or very short sighted should have this scan. The NHS eye test does not include this examination as it only provides for a basic eye exam. The advanced examination is not required for anyone with low vision, or is under the hospital for any ocular investigations. 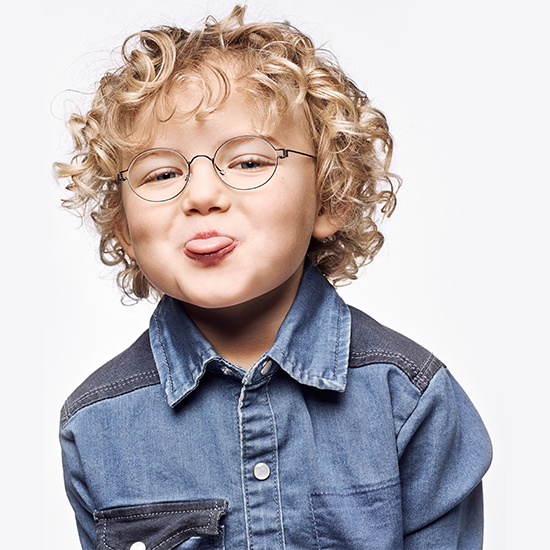 Did you know that only 1 in 5 children who start pre-school have had an eye examination? Children will rarely complain about their sight, but often show in their behaviour that there may be a problem with their vision. Good eye sight can ensure good child development. Behavioural changes from your child may include sitting too close to the TV, rubbing their eyes a lot, holding objects very close to their face, or blinking more than usual. Our Optometrists at Eye Design will carry out a thorough examination of your child’s eyes. The examination will involve a muscle balance test, colour vision, stereopsis (3-D vision testing), pupils and convergence. In some instances, some children might need eye drops for their eye examination. The eyes drops will make the pupils larger so that the Optometrist can observe the back of the eye clearly. They also relax the focusing mechanism of the eyes so that the prescription for glasses (if needed) can be as accurate as possible. Once your child’s vision has been checked it is important to continue with regular eye examinations. Your Optometrist will advise you of a recommended recall period as problems can occur at any age and even if none of the symptoms described above are displayed there could still be an underlying eye condition. Don’t worry about the costs, as all NHS eye examinations are covered for children under the age of 16, and up to the age of 18 and still in full time education.